Kingâ€™s Landing. It is the heart of the Seven Kingdoms, and the home of the Iron Throne. It is a city of lies, a city of treachery, a city of deceit. The shadows of Kingâ€™s Landing hide secrets that influence and dictate the future of Westeros. Those shadows have come to the A Game of Thrones Living Card Game. City of Secrets is the first monthly installment of 60 fixed cards for the Kingâ€™s Landing expansion to the A Game of Thrones card game, based on George R.R. Martinâ€™s best-selling A Song of Ice and Fire saga. 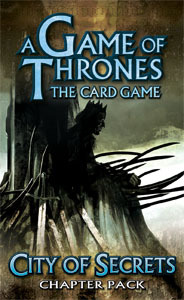 It features 20 different never-before seen cards designed to augment existing decks and add variety to the A Game of Thrones metagame. This is not a stand-alone deck. A A Game of Thrones LCG core set is required to play.